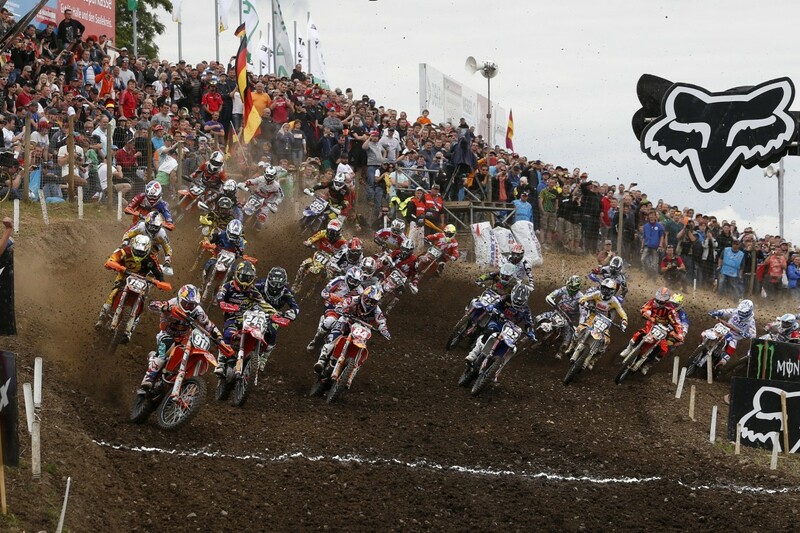 Highlights videos, news and lots of photos by Ray Archer from the 2014 MXGP at Teutschenthal! 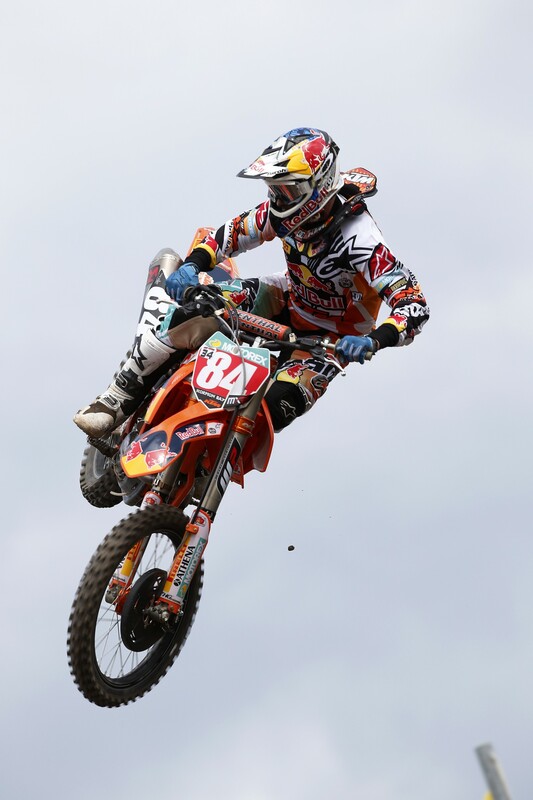 Dutch rider Jeffrey Herlings once again powered his KTM 250 SX-F factory machine to victory at Teutschenthal to claim his tenth MX2 GP win for the season from 10 starts in the 11 rounds so far held. 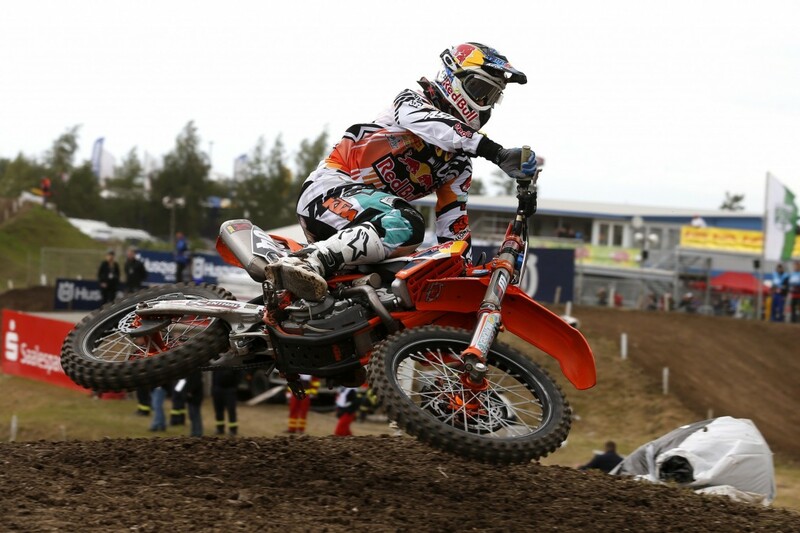 Herlings did not race Brazil because of a shoulder injury. 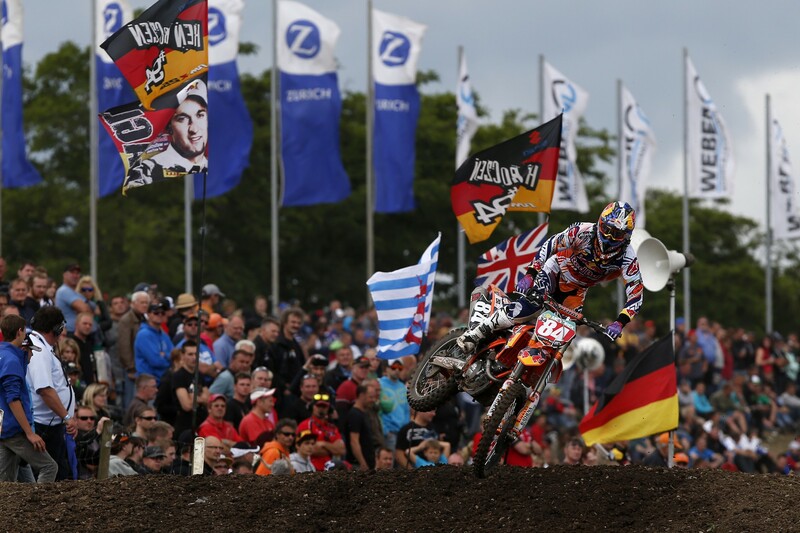 The MX2 GP of Germany was also the Red Bull-sponsored rider’s 41st GP career win – a remarkable statistic for the still only 19-year old Herlings. 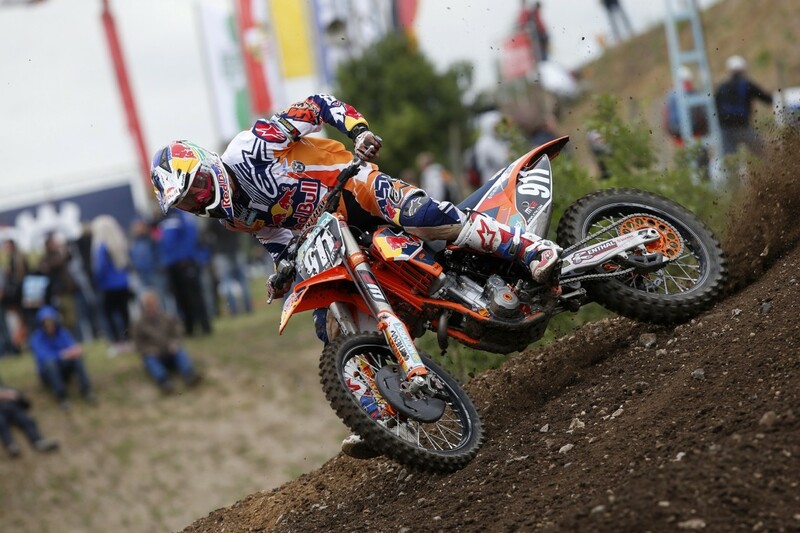 Red Bull KTM factory rider and teammate Jordi Tixier also had a good day picking up the holeshot in the opening moto and finishing overall third on the day. It was the French rider’s third consecutive podium and an indication that he has once again found his rhythm on the track. 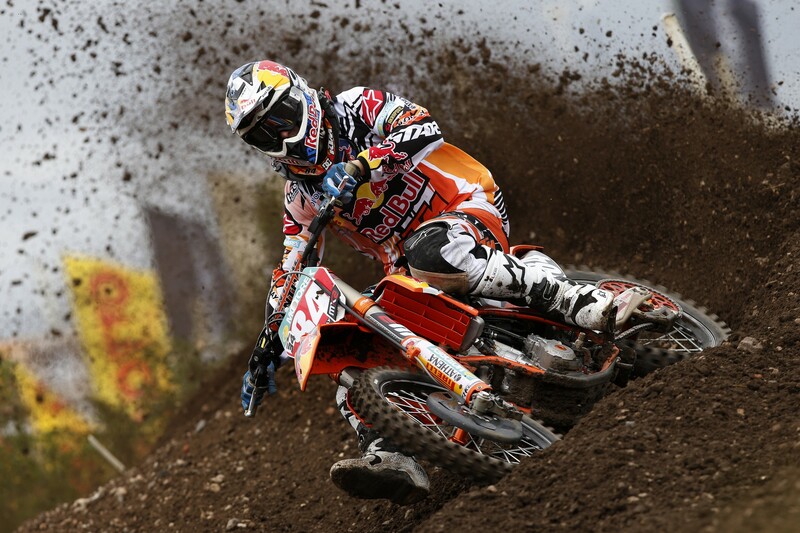 Once again Herlings made short work of a track that is not his natural habitat. 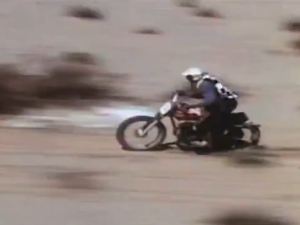 He is recognized as perhaps the best sand rider in the world but was completely at home on the hard, slick and stony surface of the German circuit. 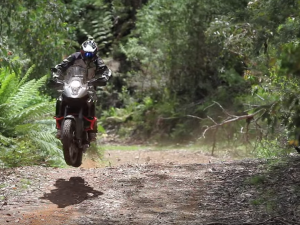 Jeffrey was third at the start in the opening moto but had moved into the lead before the end of the first lap. 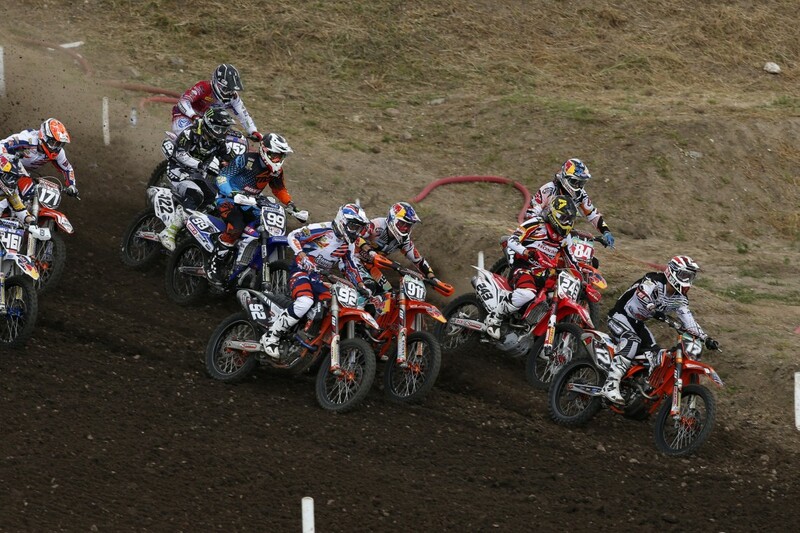 In the second moto he took the holeshot and completed yet another seemingly effortless gate-to-flag victory. 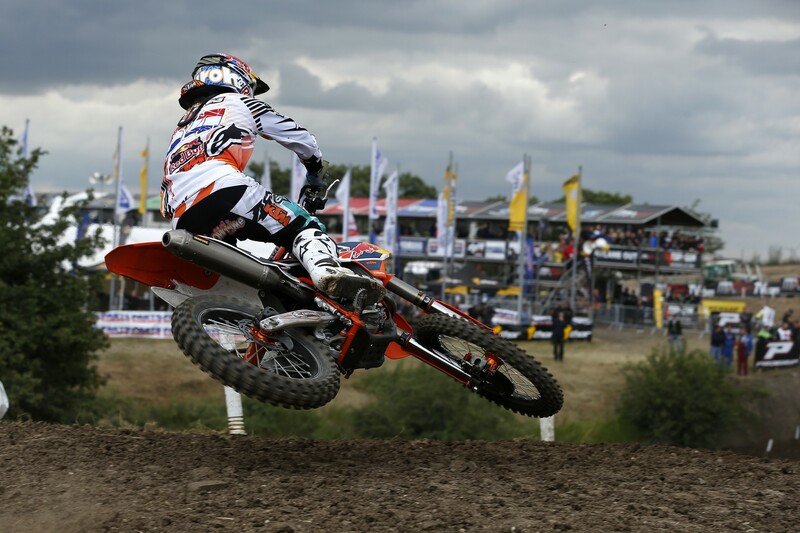 He now has a stranglehold on the championship with an impressive 105-point lead and seems to be heading for his third MX2 World Championship title. 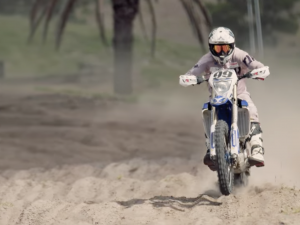 The points advantage also reflects the fact that his closest rival, Arnaud Tonus was unable to ride in Germany because of an injury. 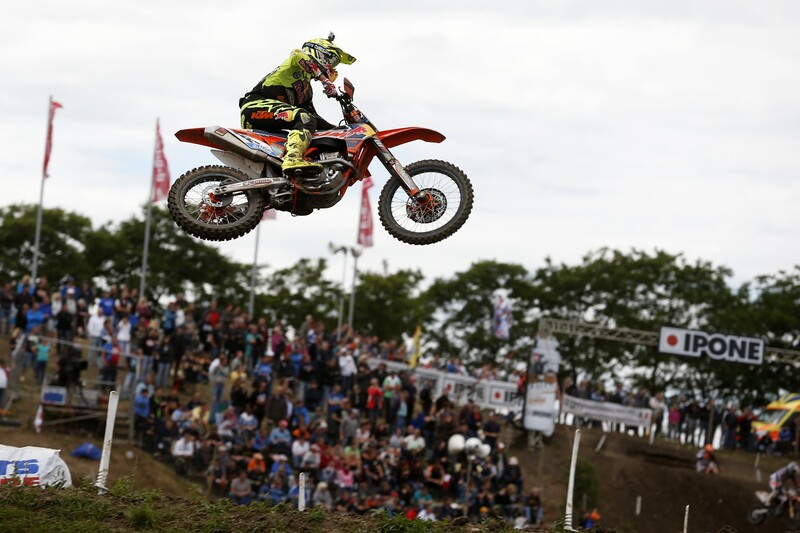 In contrast, it was a tough weekend for Red Bull KTM’s Antonio Cairoli, the championship leader in the MXGP class, who battled his way to a commendable fifth place overall on the German circuit, riding ill and under antibiotic treatment. 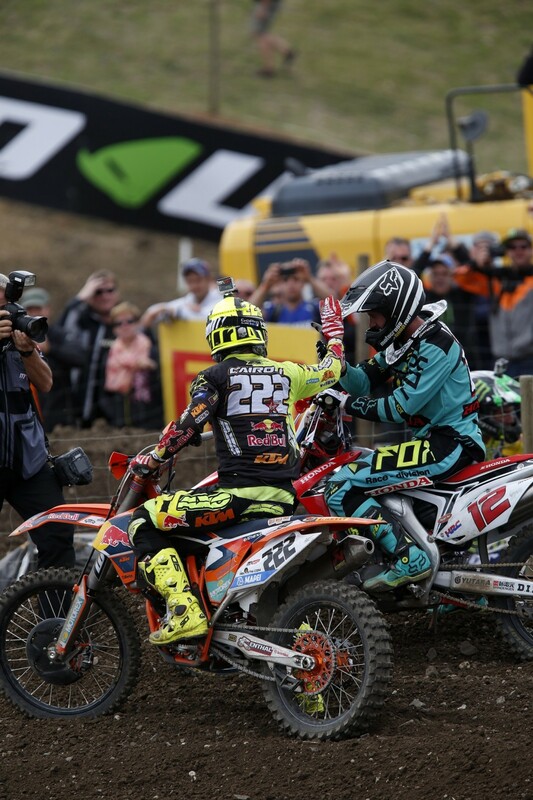 On Sunday the Italian seven-times world champion did sacrifice some points to Belgian rider Clement Desalle of France, his closest rival for the 2014 title. 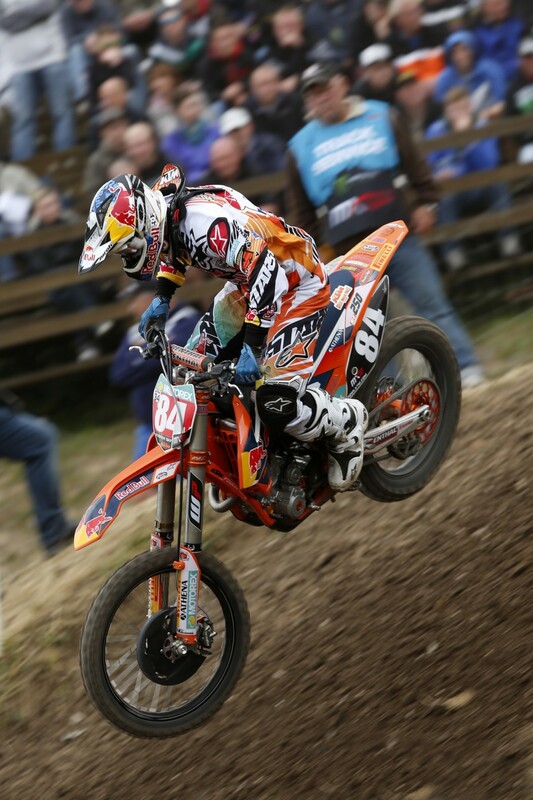 Desalle was the overall MXGP winner in Teutschenthal. 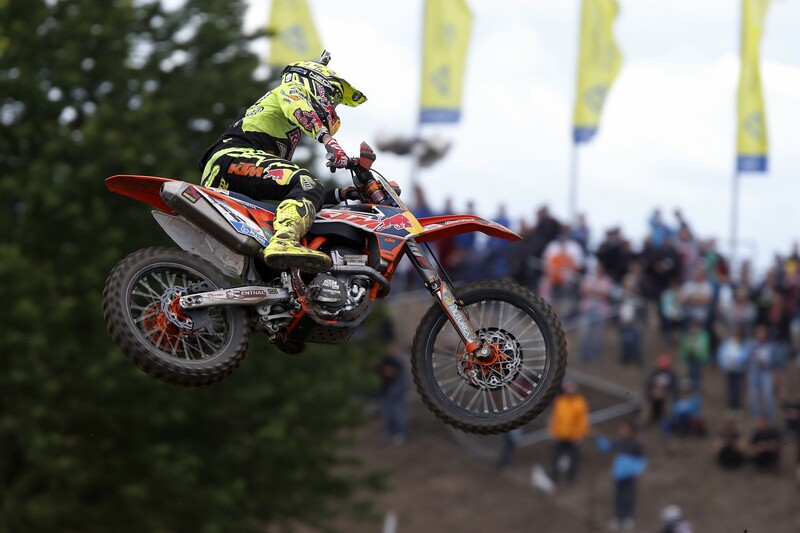 Nevertheless, throughout the day Cairoli showed his usual fighting spirit and delivered an impressive ride, given the circumstances. 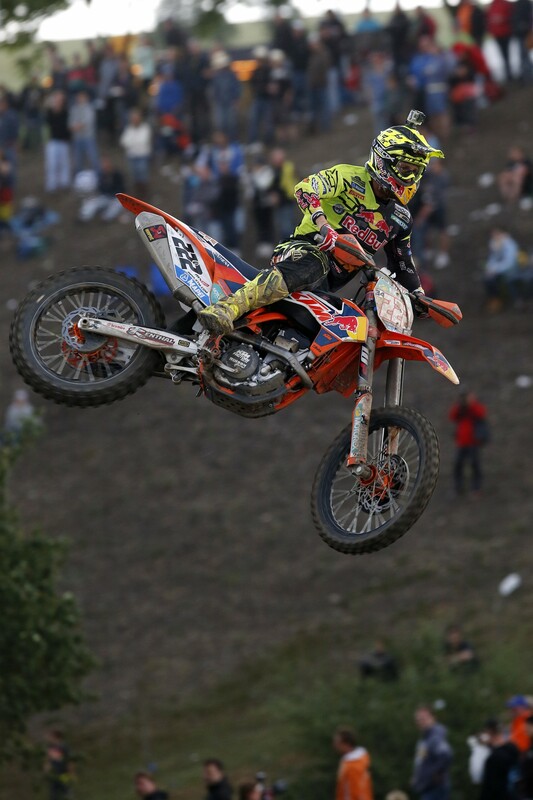 Cairoli, on the KTM 350 SX-F went on the attack with Jeremy van Horebeek for fourth place in the closing stages of the first moto but was unable to make his pass stick. 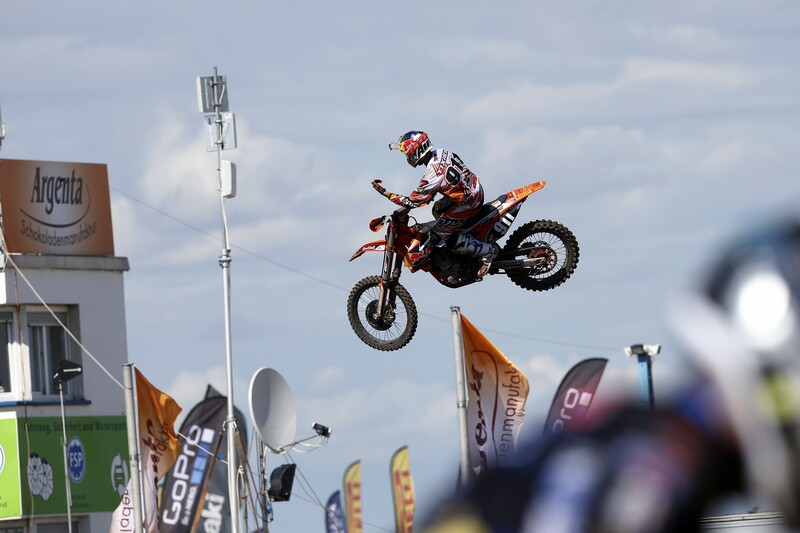 Then in the second moto he was seventh at the start and advanced three places up to fourth at the finish for a 5-4 result and an overall fifth place. 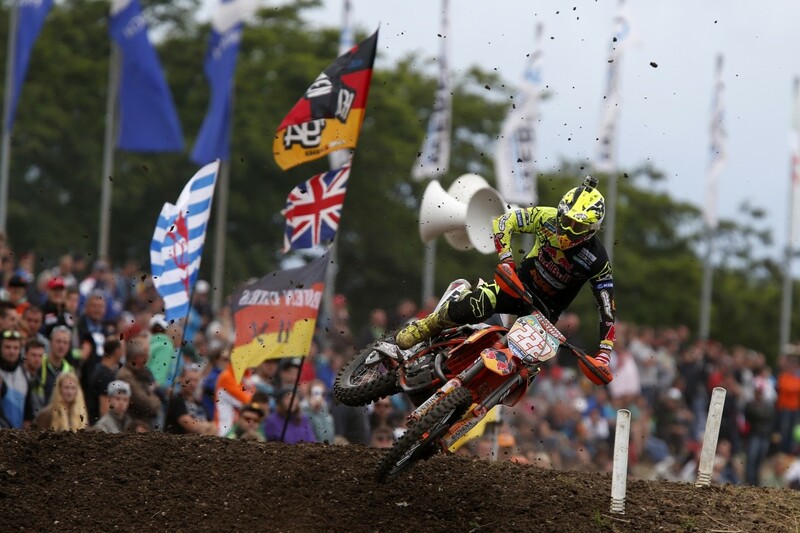 Cairoli has a 25-point lead over Desalle and as the competition resumes in two weeks time, he has the chance to recover his heath to get back to the battle for the title. 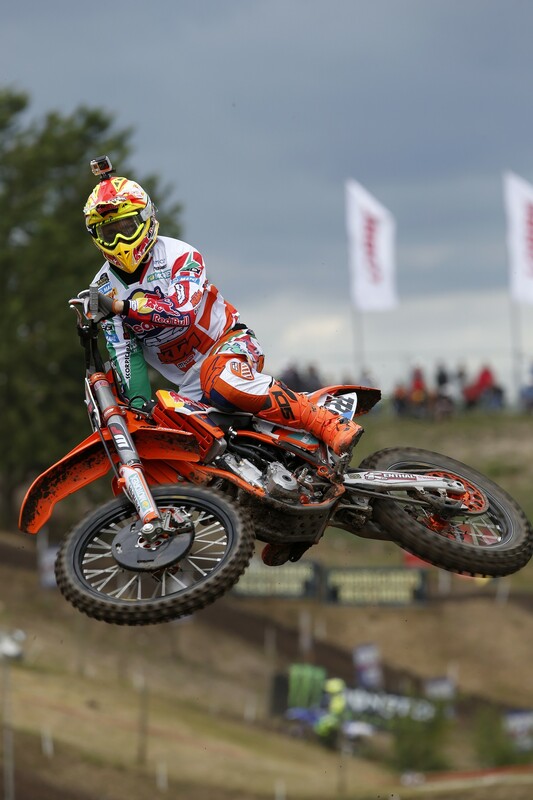 Meanwhile, Cairoli’s Red Bull KTM Factory Racing teammate Ken de Dycker of Belgium continued to make progress as he fights his way back to full health and fitness after a very long injury break. 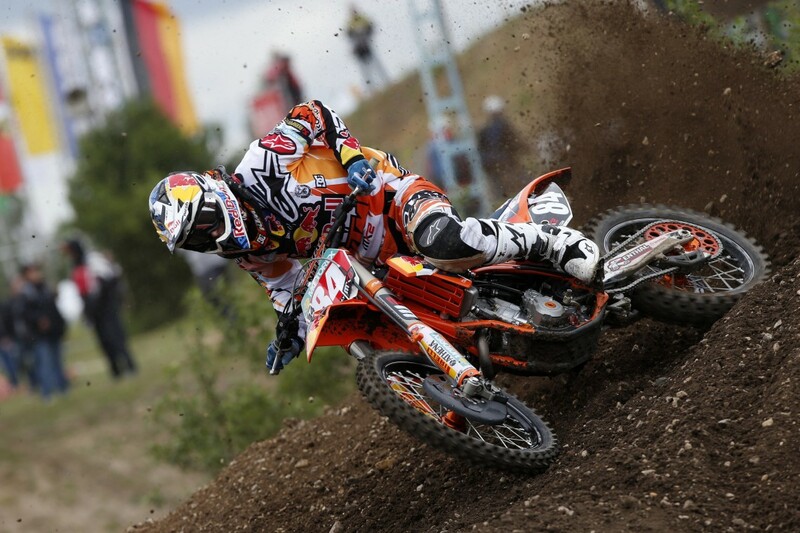 He wrapped up his weekend at Teutschenthal with a 13-11 result for overall twelfth. 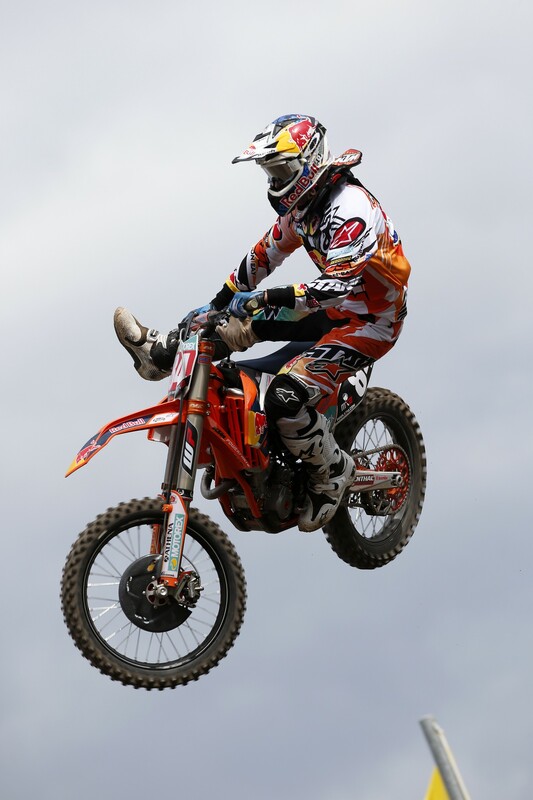 De Dycker said he was a little disappointed not to be able to repeat his top ten finishes that he managed in the last round in Italy but admitted he still needs to build up his confidence after his injury problems. “Physically I feel really good especially after today where I had two motos where I was stronger at the end than at the beginning. 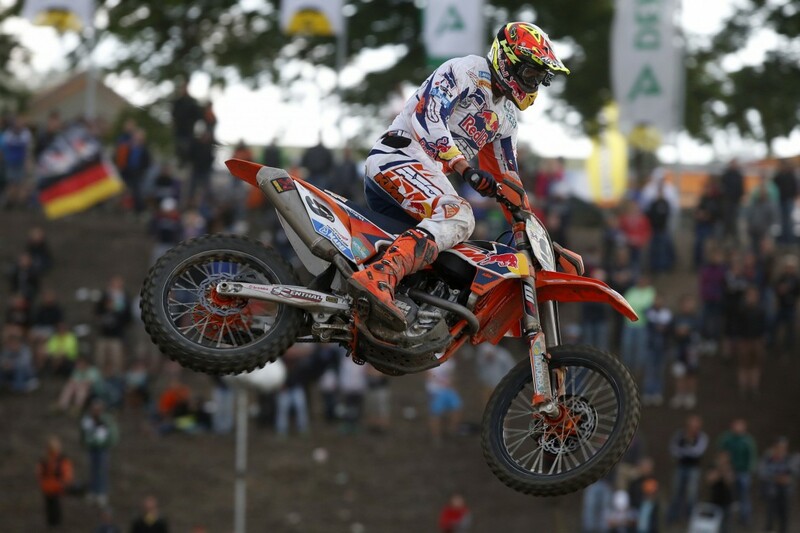 Now I just have to believe in myself,” De Dycker said after the races. 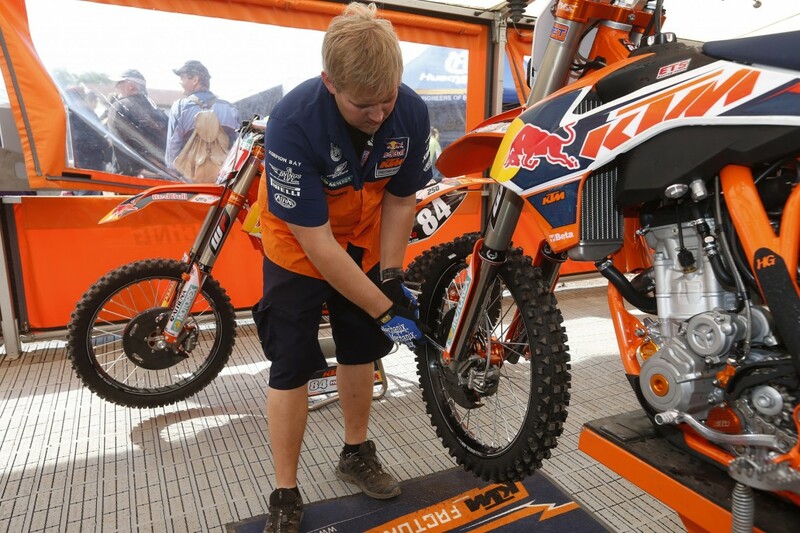 The competition resumes in Uddevalla, Sweden on July 7, the first of two calendar stops in Scandinavia.